Smart Motorways are an increasing occurrence on UK Roads, know the facts. You may have seen the increasing presence of smart motorways on UK roads, these are a technology-driven approach to the use of motorways. A smart motorway is a section of motorway that deploys traffic management methods in busy areas to reduce congestion and increase capacity. The latest smart motorways are designed to ease traffic flow in congested areas of the country at peak times utilising Active Traffic Management (ATM), this involves turning the hard shoulder into an additional running lane and informing motorists that the hard shoulder is active via the overhead gantries that run along the entire route of a smart motorway. Close lanes in emergency situations. Vary the speed limit to smooth traffic flow to help improve journey times. Close and open lanes – for example, to allow emergency vehicles through. Activate warning signals to alert drivers of traffic jams and hazards ahead. The above sign means that Active Traffic Management is in place on the smart motorway and there is currently no hard shoulder available, driver should use all lanes available, referring to the overhead signs for speed limits, directional arrows and lane closures. Emergency Refuge Areas have been introduced in smart motorways as the hard shoulder may be unavailable due to Active Traffic Management being in place. 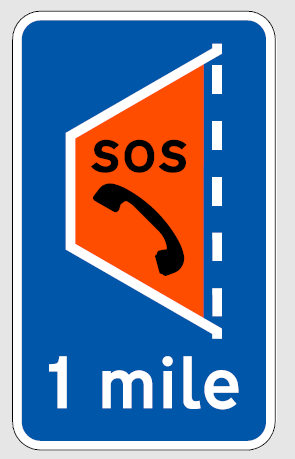 Drivers experiencing any difficulties should make their way to the nearest refuge area, which will be marked with blue signs featuring an orange SOS telephone symbol. In all cases, switch on your hazard warning lights when the vehicle is stationary. If you can get to a refuge area and leave your vehicle safely, contact Highways England via the roadside emergency telephone provided in the refuge area. They will either send a traffic officer to help you or set the motorway signs to temporarily clear the nearside lane to assist you to re-join the motorway. If you cannot get to an emergency refuge area but the vehicle can be driven, move it to the hard shoulder (where provided) or as close to the nearside verge or other nearside boundaries if possible. If you stop in the nearside lane next to a hard shoulder or verge and feel you can exit safely with any occupants, consider exiting your vehicle via the nearside (left hand) door, and wait behind the safety barrier, if there is one and safe to do so. If it is not possible to get out of your vehicle safely, or there is no other place of relative safety to wait then you should stay in your vehicle with your seatbelt on and dial ‘999’ if you have access to a working mobile phone. Once the regional traffic control centre is aware of your situation, via the police or roadside technology such as CCTV, they can use the smart motorway technology to set overhead signs and close the lane to help keep traffic away from you. They will also send a traffic officer or the police to help you. A recent RAC study found that the distance between the emergency refuge areas, 1.6 miles, is causing concern for some drivers as many weren’t sure what to so in the event of a breakdown. This shouldn’t be a concern as smart motorways should be constantly monitored, meaning that if you do end up stranded, highway patrol can be sent out for assistance and overhead gantries can be activated to warn approaching drivers to act accordantly. One of the most important signs to recognise on a smart motorway is the Red X signal, this indicates that the lane is closed. If you see red x above your lane, you must move out of the lane promptly, if you continue to drive on a closed lane you risk prosecutions and a fine. The signal is used to manage a range of circumstances such as debris on the road, vehicle break down, emergency services or roadworks. For your own safety and the safety of others, never drive in a lane closed by a Red X.